Every Star Wars film needs a bad guy and Attack of the Clones saw the introduction of Sith Lord Count Dooku. Played the the legendary actor Christopher Lee, Dooku was a key player in the Clone Wars. Here's some facts and trivia about the character's place and effect on the Star Wars universe. Although Count Dooku is the main villain and is mentioned in the opening crawl of Attack of the Clones he does not actually make his first appearance until 76 minutes into the film. Before Anakin beheaded Dooku in the opening act of Revenge of the Sith, he cut off his arms, making him the 5th person to lose an arm in the franchise. This is in terms of order of the films coming out. If you go chronological order he was the third after Zam Wessel and Anakin. It was a nice revenge for Anakin too. Christopher Lee played Dracula opposite A New Hope's Peter Cushing as Dr. Van Helsing in a few movies. When he was a Jedi, Dooku's first padawan was The Phantom Menace's Qui Gon Jinn. Actor Christopher Lee said of his character: "He's very aloof, very self-contained, obviously completely fearless. He is extremely intelligent, perhaps more so than almost anyone else. He's obviously a man of immense power. I don't suppose that the question of moral values enter into his head. He's not immoral -- he's amoral. Morality is a word that doesn't figure in his vocabulary at all. It's power. Which is something that exists very much in our world today." Dooku was at one time in scripting considered to be a female sith. The rejected concepts for this idea where eventually channeled into the development of Asajj Ventress, who appeared regularly in the animated Clone Wars show. Count Dooku only speaks a total of four lines in Revenge of the Sith! Word on the street is a line was cut from the film where Dooku admitted to Anakin that Tusken Raiders who kidnapped Anakin's mother, Shmi Skywalker were paid to do so by Count Dooku. Dooku had done this on orders from his master, Darth Sidious. The idea was to stir up Anakin's emotional state. Clearly that worked. Due to Lee's age when filming his role, Kyle Rowling portrayed Dooku during most of the character's lightsaber sequences, Rowling's head was digitally replaced with Lee's during post-production work. 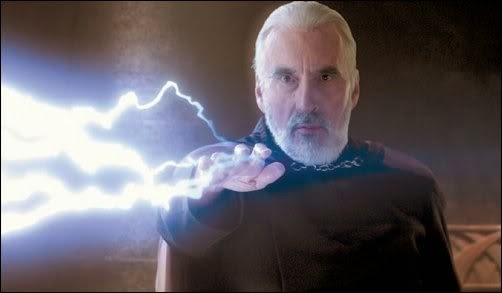 Christopher Lee appears in the Clone Wars film, doing the voice of his character. In the Attack of the Clones scene where Count Dooku visits his prisoner Obi-Wan Kenobi and tries in vain to recruit him to his side was not in the original shooting script. This scene was filmed during reshoots and was designed to deceive the film viewer into thinking that Dooku may not be an evil character after all. Other scenes had been filmed that showed a trial for our captured heroes where Dooku's allegiances were firmly established.